Day 4: Wesley Beins (SGP) bridges to his shot. Photo courtesy of Bob Lerch. 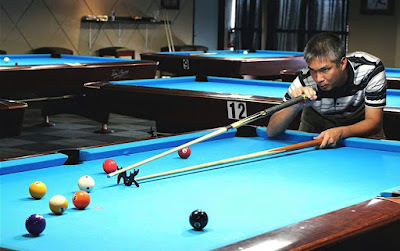 FAIRFAX — Day 4 of the Pocket Billiards competition from the World Police and Fire Games has concluded. Competitors squared off in a quadruple-qualifying bracket in 8Ball. The discipline was staged according to CSI/BCA rules. The key parameters included open on the break, establish suit, call pocket, and ball-in-hand fouls. “It was refreshing to field questions from spectators about our pro-am guidelines,” offered sport coordinator Eric S. Townsend. “Most in the United States are familiar with a less-intentional pub version of the game that lacks design and even rewards mistakes,” added Townsend. The tournament format again earned rave reviews, as administered by Pennsylvania 9Ball Tour’s Dan Madden. Entrants were given up to four losses before being eliminated. The no loss and first loss brackets raced to 4, while the two and third loss brackets raced to 3. “Most of these competitors play above my skill level,” admitted Kieran Mussen, a fireman from Perth, Australia. “Your tournament runs smoothly and keeps players in the hunt” recognized Mussen. The field was narrowed to a final grouping of 8 players in medal contention. They were: Wesley Beins (Singapore), Doug Moreau (Canada), John Griffin (Ireland), Genadijs Kaminskis (Latvia), John O'Sullivan (Ireland), Joe Rodriguez (USA), Michael Grosso (USA), and Chris Gloerson (USA). The slate culminated in the medal ceremony for straight pool, a celebration made special by visits from delegates of the Boy and Girl Scouts of America. Gifts from Shaun Wilkie, a top straight pool player in the world, added an intimate touch to the proceedings. Wilkie crafted congratulations to each of the medalists on autographed glossies, plus provided a copy of a recent magazine feature. Both are suitable for framing. Matches resume tomorrow from Breakers Sky Lounge​ in Herndon, Virginia at 9am. Medal winners will be awarded at 3pm. Enjoy this great event through the live stream available on the away channel at www.tvmike.tv.